Government technology, bringing you the marvels of yesterday today! We just had a hallway ceiling light go out; the way it flickered before going dark let me know it was a fluorescent bulb, and I looked forward to replacing it with one of the newer, less expensive and more energy-saving LED bulbs I’ve got in the closet for just such an opportunity. Until I pulled it out and saw the two-legged alien creature inside. I was right about the fluorescent—it’s a 13-watt compact fluorescent bulb, 60-watt. Perfect for replacing with one of the cooler 10-watt LEDs in the closet. Except, of course, that none of them will fit as a replacement. 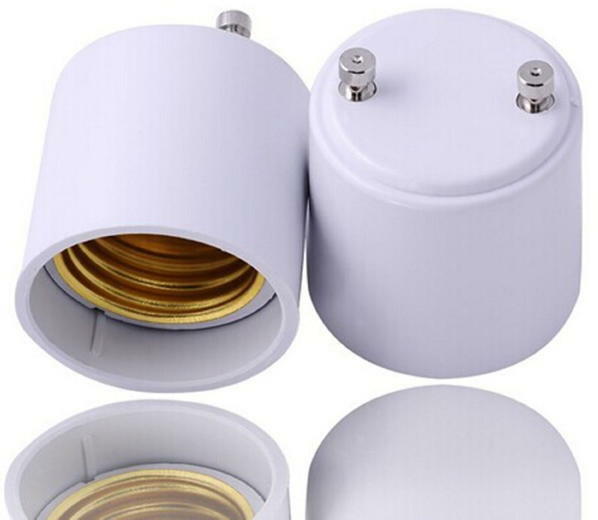 I did a quick search on two-pronged light bulb and discovered that this is a GU24 pin-base that “ensures that lighting systems intended for high-efficiency lamps cannot be used with incandescent lamps”. This is government-driven technology change. California, for example, in 2008, basically required the use of them for “all residential remodels and new construction”. A high efficacy lamp screwed into a low efficacy luminaire will still be considered to be a low efficacy lighting system for Title 24 projects. 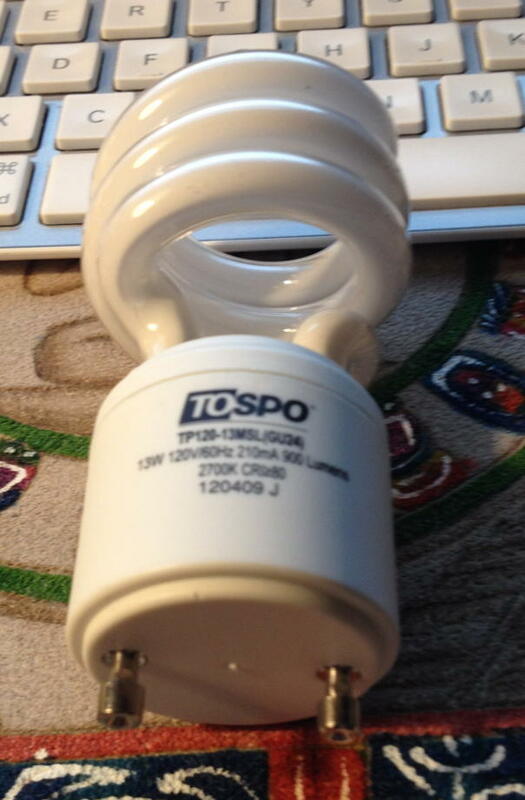 It was a government plan to enforce low-energy lighting, yet, now, in the socket that has one of these, I’m probably going to have to put in a 30% more power-hungry bulb than if it had the standard screw-in socket. A bulb that will have to be thrown out sooner, and that contains mercury. Back in 2011 BuildingGreen.com claimed that GU24 sockets were “gaining momentum”. But their bulbs remain expensive now, three years later—especially for the better LED bulbs. GU24 LED bulbs do exist, but instead of costing $4.49 from Ikea the cheapest I’ve been able to find is a $23.95 one on Amazon. So either I buy an adapter and risk extending the length of the socket too much for the fixture, or I get a $5.78 fluorescent that uses more power and will have to be thrown out sooner. This is what happens when government enforces a technology: technology moves much faster than government, and the mandate eventually breaks what it was meant to fix. Since the GU24 adapter on Amazon was less than two bucks, even with shipping from China, I decided I’d try that before rewiring the whole system. It just arrived last week (it took about eight weeks to get here), so I have a nice, inexpensive LED bulb in the GU24 adapter. As a bonus, it no longer takes a second or two and then some flickering to light the hallway after flipping the switch. I’d like to say here, I’m not averse to the Edison-bulb connector going away and being replaced with something better. I’ve had too many incandescents get stuck, requiring so much force to unscrew that the bulb itself starts to break. But the way to fix that is not to enforce a different connector on bulbs that most people don’t want to use. If GU24—or any future new connector—is advantageous, it should be allowed to be advantageous on all bulbs, not just the ones that government in its love of complex technologies thinks will never be superseded by something better. If GU24 had been allowed for incandescents as well, it might well have taken off enough for LED bulbs using it to be less expensive—if GU24 provides actual benefits over the Edison-style. But because the government forbade using GU24 with the light bulb most commonly used in homes, it’s likely we’re stuck with the older style for the foreseeable future. Incandescents, CFLs, and LEDs compared. GU24: Government-enforced energy-wasting lamps last modified December 3rd, 2014.